Can't they offer an additional year and more money, though, with rights? I'm only saying that since he's clearly the best big they have. But like I said and you said, not necessarily on the same timeline as their other young pieces. But they have since may 2017 a new GM Hammond. Hammond drafted Isaac and Bamba. Thats why they were rumours that the Magic wanna trade Gordon, even with his friendly contract. Because Hammond wanna make place for his draft pick Isaac. Handing out Vuc a huge new contract would also raise the question why he drafted Bamba in the first place. Last edited by sefant77; 02-09-2019 at 12:03 PM. What do people think about Bobby Portis? Love Bobby P, always make known my bias as an Arkansas fan. Never have seen him mentioned as an immature idiot, not sure where that would stem from? I know he's had some things to say about his trading away but I think way less than DSJ or others. He's a big 4 who is long, can defend, rebound, and knock down the three. He's also shown some improved post work he didn't necessarily have at Arkansas. Can't say I've seen a lot of Bulls games, but the guy can play. May be redundant here as a fit with KP and would rather lean a rebounding 5. Portis is going to be too expensive for Mavs' plans, I think. Thanks for the info, good insight and angle I hadn't thought of. Last edited by sefant77; 02-09-2019 at 01:28 PM. Who would be a big time free agent that fits in best in a lineup that has KP, Hardaway, Luka??? Klay comes to mind for me. Can’t see him pick the Mavericks over GST or LA. A really good guard/sniper that can defend is what we need. Last edited by NBAfan1996; 02-10-2019 at 06:26 AM. Klay would be absolutely phenomenal for ANY team. Unfortunately, he seems very happy with GSW and I think there's virtually a 0% chance he leaves. So then who is a realistic target? We could max out DAngelo Russell but I see Nets matching. Can’t think of another versatile guard that would fit well with Luka, who is also a free agent. Patrick Beverley and Bojan Bogdanovic are the first two names that come to my mind. I think Malcolm Brogdon will definitely be target too, but I'd say the chances are lower given that Milwaukee are legit contenders at the moment. I could also see us buying low on Trevor Ariza. He's old but he's still an effective 3-and-D guy. I really like Bogdanovic and Brogdon and think they should definitely be targeted in the off-season. Trev and Bev would be perfect fits but their ages really turn me off because I'd prefer to build with guys closer to Luka's and KP's ages than retirement ages. Personally I think DFS has a ceiling very close to Trev so he is a perfect fit imo. My dream would be to land Brogdon and Vuc in the off-season. 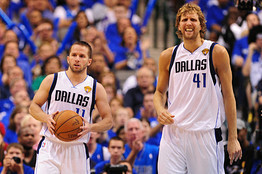 Not likely but it would be awesome if Mavs could somehow make that happen. Last edited by rimrocker; 02-10-2019 at 07:33 AM. Last edited by sefant77; 02-10-2019 at 11:39 AM. Not to mention Brogdon is a RFA. If Golden State is hell bent on resigning both KD and Klay (rumor is they are) they will have to dump a contract. The Mavs have the $25 mil trade exception. They could give the Warriors $18.5 mil in cap space by trading Draymond Green for cap space. Basically they would be acquiring Draymond the same way they acquired Andrew Bogut a couple years ago. Didn't realize that. I think we can pretty much scratch him off the list then. Too bad because he'd be a great fit here. If we are writing off Portis because of incidents in the past, then Green should be along the same lines. I'd love to see him on another team and get exposed. He gets carried by their other superstars. I can’t wait to watch Green go to another team and get exposed finally. Can anyone provide insight into scenarios where we use the trade exception? Also, I like Vuc, but I imagine his price tag will be hefty. Not sure if he brings the athleticism that we need in the paint to pair with KP and Luka. Yeah but he has some size and bulk which is something we could use in the paint. I don't disagree. And he has a high level of skill. My issue is the contract. He will command top $. I almost feel like we should swing for one of the top Superstars available. If it doesn't work, we fill the team with solid contributors around KP and Luka. Let them get chemistry and experience. Remain flexible. Unfortunately just about any quality player will command top $. Such is life in the NBA. Last edited by Thespiralgoeson; 02-10-2019 at 11:28 PM. Honestly I would only want him for the final year on his contract. He’s UFA in 2020. I’m looking at guys that won’t affect the Mavs cap in 2021 when Giannis is a free agent but could also help in the short term. Even if his shooting % is down his defense and toughness would help this team. Trading Draymond for cap space is the best scenario I could come up with. There HAS to be another player or players though that teams are willing to dump just to clear money off their books. Another way signing Vucevic would help that no one has mentioned is the Mavs are going to have to keep KP’s minutes down for at least the first year he’s here. With his healthy I’d expect Carlisle to want to keep his minutes to around 25 a game like he did with Tyson Chandler. So there would be a big portion of the game where Vucevic is the primary big on the floor with Luka. I wouldn’t be surprised if Carlisle switches them in and out so that one of them is always on the court at all times. Then in crunch time they’d be on the court together. See, this is exactly what I hope the Mavs DON'T do. That's plan powder thinking right there- only get guys on short term deals to keep cap space available, hoping that you can lure the big fish free agents. I'd tap the breaks on any of this "Luka and KP make Mavs attractive for free agents" thinking until they've actually been successful on the court together. And even then, I think the chances of us snagging Giannis away from Milwaukee would be slim. Yes, we know Giannis really likes Luka. But that does NOT mean he'll leave the Bucks, who put an absolutely solid supporting cast around him and made that team into a legit contender. I think the only way Giannis leaves is if things unexpectedly go very bad very quickly in Milwaukee. They're not a particularly young team, but they're not that old either, so there's no reason to expect things will go South in the next two years. Agreed 100%. If you strike out on big FA's then sign smart contracts that at worst can be flipped later for assets and at best fit with Luka and KP and bring us back into contention. Waiting on Giannis with dry powder would be 2nd behind overpaying 3rd tier guys as the worst options this summer. Yeah, that is why Vuc makes a lot of sense for the Mavs. You'll get solid rebounding and good offense to make up for any downtime that KP might have. Plus his game complements KP and Maxi's well. Ideally I'd rather have an athletic above the rim center with Vuc's skills to play with Luka but those kind are hard to find and usually unavailable. Last edited by rimrocker; 02-11-2019 at 06:32 AM. Glass half empty: Giannis isn't leaving the Bucks so stop considering it possible that even if he did he would want to come here. Glass half full: They are having a great regular season, but they have to prove it in the playoffs. That's not easy to do. Giannis is the only one I would bet on to keep up his level of play. If the guys around him can't sustain their production, maybe he gets frustrated and entertains bailing. Sounds like a 2012 repeat. Waiting on the divas to decide what they want to do then all the second tier guys sign other contracts. Then the divas go to another team. Sign Vucevic first day of free agency. Besides the rebounding we miss from Jordan we miss those pick and rolls too. Having a legit big man setting the screen at the top makes a difference compared to Powell doing it. Yep. Commit to a direction and sign Vuc immediately. I don't think Giannis is a pansy..he's the type of guy that'll want to get it done on his team in my opinion. Yes, the Clippers have done a nice job with this. It maintains a good team with good assets to flip. Lou Williams, Harrell, Bradley, Beverley, Galinari to a lesser extent. And of course they were able to flip Tobias for nice assets. 2) Dewayne Dedmon - by far the number one guy I want; can shoot as well as Nikola but brings way more defense... leads the hawks in DRTG, DWS, and DBPM. 3) Javale Mcgee - before you laugh he brings everything Dedmon does other than the shooting.... leads the Lakers in DRTG, DWS, and DBPM. Now I've not watched anything other than this play but I have to lean towards agreeing with the announcers that it was incidental contact because Portis got a ton of ball with his arm hitting the other player's arm. There was no contact with the head or anything. Now that guy took a really nasty spill and for the sake of not letting the game get out of hand, I kind of see the point in flagrant 2 ejection just so there isn't anything in retaliation. But that play looked pretty legit as a defensive play which is why I think he was also smiling as he's walking back to the locker room. He knows he had a good play with just a bad result, although being seen smiling is in very poor taste. Everything else you said about him does raise red flags. Last edited by Murphy3; 02-11-2019 at 04:49 PM. Last edited by turin; 02-11-2019 at 05:03 PM. So what would you do? Max out lesser talented guys just for the sake of signing someone? The best guy available this off season that is realistic for the Mavs is Vucevic. Personally I’d be happy with Vucevic but their Interior defense and P&R defense could be really bad. Willie Cauley-Stein will be available although I think he’s RFA. Every year there are a couple like him available though.